This blog compliments of Red State, a conservative online newspaper. The Democrats, in particular Joe Biden and Barack Obama, are out to make the moral case for tax increases. They claim the Republican position is immoral. This is what happens when we debase morality in our American political culture. For perspective, when Barack Obama was a state senator in Illinois, he was the only state senator to speak in opposition to the Born Alive Infant Protection Act. He stood up and made the case that if an infant is born alive in the process of an abortion, the doctor who botched the abortion should be able to finish off the kid, even though the child had exited the womb alive. That, my friends, that is immoral. Republicans arguing that the government should let hard working Americans keep their own money is not an immoral argument to make — particularly given how ineffective and inefficient government use of that money would be compared to private enterprise and non-profits. For Barack Obama and Joe Biden to make this a case of morality is a reflection of their weak moral compass. So what else is new from this President? Blame everyone else for our problems but never take responsibility for his faults in running the country. I didn’t watch the press conference today but want to share some highlights I found on a Town Hall article written by Katie Pavlich. Also I understand that Obama repeated a choice between corporate jets and kids. Yup, that’s the way he likes to demonize everyone and make you feel bad especially for the kids. He said if we need to stop giving tax breaks to big business and oil companies otherwise we won’t have money for the kids’ college. He once again pits rich vs poor – us against them – a straw man mentality. I am so tired of him and his fellow Democrats demonizing everyone and pulling out the class warfare card. Then Obama said his administration is reviewing government regulations that hinder entrepreneurship, adding he is working with the private sector to spur job grown but slammed business owners as “wanting to do whatever they want to gain maximum profits.” Is Obama for real? Why does he think the reason for people to open a business – to make money of course! Oh that’s right he’s never had a private job before and thinks only government jobs are the right jobs. Then he said, “The business community is always complaining about regulations.” Yes there you have it, he’s all for the little guy but they better jump to the government regulations that stifle their growth. On the issue of job growth, the President again tried to sell the idea that the government creates jobs. “Congress could send me a bill right now that would put construction workers back on the job,” he said. Who is going to pay for those jobs, Mr. President? The taxpayers of course! industry to pay their fair share. What can I say? He just doesn’t get it does he? And these people think they’re the smart guys, and we’re the dummies, even though we know that German is spoken in Vienna, and many of us would be mortified to make a glaring error about an American hero. The gaffes are important. They tell us a lot about the nature of our leaders, and it’s not good news. But it is news…even though it’s not reported as often as it should be, or with the sort of concern the gaffes deserve. Forget about Obama, the joke is on the media here. They created him and now they are trying to explain him. If they had done their jobs, he never would have been elected. I agree. There were plenty of clues in 2008 that Barack Obama was not qualified to lead America, and the Democratic party had several more qualified candidates to choose from. But the liberals selected Style over Substance, Ambition over Leadership; and then hoped that he—and we—could survive until he accrued enough on-the-job training. But Barack Obama lacks more than just experience. And no amount of on-the-job training will make up for a lack of character, integrity, and intellect. Two unconnected developments were announced this past week. President Obama is releasing oil from the Strategic Petroleum Reserve, despite the absence of a global embargo or horrific natural disaster — and despite a litany of assertions from 2008 that drilling and increased supply might only have a marginal effect on prices. Like the sudden Afghan withdrawal announcement, the tapping is largely explained by political worries about reelection, as in increasing oil supplies to lower gas prices by election time — and thus avoiding campaign ads equating Obama’s opposition to drilling with high prices at the 2012 pump. All this raises some questions. The strangest things about the global statist crack-up are socialists’ unhappiness with their socialist utopia, and their subsequent efforts to avoid the consequences of the very redistributive state that they themselves once so gladly crafted. Greece is the locus classicus. Why are the Greeks protesting? Against whom? They obtained long ago the promised bloated sector and high taxes that all schemed to avoid. Their alma mater EU is hardly a demonic capitalist-run plutocracy, but a kindred socialist state. Is Greece an oil producer, industrial powerhouse, high-tech innovator — anything that might explain the sort of upscale life, modern infrastructure, legions of Mercedeses, and plush second homes that one began to see in Greece after 1985? In truth, socialist Greeks are furious that they have impoverished themselves and demand that private money and far harder-working Germans bail them out — but why so, when socialism should not need outside capitalist-generated dollars? Could not the Greeks, Soviet style, set up a Cuban collective, and adjust their lifestyles (there goes Kolonaki culture) to their means, living in an opportunity of result utopia with a huge public sector, more siestas, high but ignored taxes — with a collective good riddance to those awful intrusive German bankers? The U.S. is in the midst of an energy revolution, and we don’t mean solar panels or wind turbines. A new gusher of natural gas from shale has the potential to transform U.S. energy production—that is, unless politicians, greens and the industry mess it up. All of this growth has inevitably attracted critics, notably environmentalists and their allies. They’ve launched a media and political assault on hydraulic fracturing, and their claims are raising public anxiety. So it’s a useful moment to separate truth from fiction in the main allegations against the shale revolution. 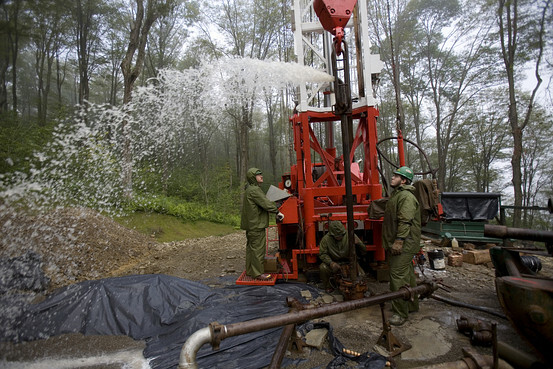 Getty Images A drilling team from Minard Run Oil Company pull out steel pipe during a fracking operation at a 2100 foot natural gas well in Pleasant Valley, Pennsylvania in 2008. They failed to note that researchers sampled a mere 68 wells across Pennsylvania and New York—where more than 20,000 water wells are drilled annually. They had no baseline data and thus no way of knowing if methane concentrations were high prior to drilling. They also acknowledged that methane was detected in 85% of the wells they tested, regardless of drilling operations, and that they’d found no trace of fracking fluids in any wells. Drillers must dispose of fracking fluids, and environmentalists charge that disposal sites also endanger drinking water, or that drillers deliberately discharge radioactive wastewater into streams. The latter accusation inspired the EPA to require that Pennsylvania test for radioactivity. States already have strict rules designed to keep waste water from groundwater, including liners in waste pits, and drillers are subject to stiff penalties for violations. Pennsylvania’s tests showed radioactivity at or below normal levels. • Shale exploration is unregulated. Environmentalists claim fracking was “exempted” in 2005 from the federal Safe Water Drinking Act, thanks to industry lobbying. In truth, all U.S. companies must abide by federal water laws, and what the greens are really saying is that fracking should be singled out for special and unprecedented EPA oversight. The question for the rest of us is whether we are serious about domestic energy production. All forms of energy have risks and environmental costs, not least wind (noise and dead birds and bats) and solar (vast expanses of land). Yet renewables are nowhere close to supplying enough energy, even with large subsidies, to maintain America’s standard of living. The shale gas and oil boom is the result of U.S. business innovation and risk-taking. If we let the fear of undocumented pollution kill this boom, we will deserve our fate as a second-class industrial power.